I’m a small girl with big dreams that sometimes feel unrealistic and pretty far away. When self-doubt and impatience kick in the Lord never fails to remind me who I am in him. Are you struggling with contentment? I feel ya, I’m in the same boat but what helps me is to focus on the steps I am taking now. If I only focus on the finish line then I miss out on all the things I am passing. Life’s a journey and God knows exactly how he wants us to take it. We are able to learn so much more and help so many more people if we focus on what’s around us, not just what’s ahead. So finish that race strong but don’t forget to enjoy the view while you’re at it. When finished you will most likely be all sweaty and out of breath but as you look back you will be able to see why the journey was so hard and what God did through the almost unbearable circumstances. 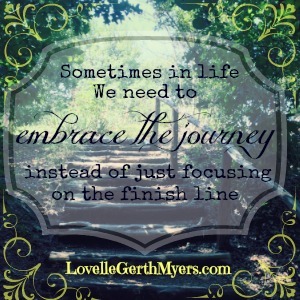 This entry was posted in Growth and tagged seedsforyoursoul on October 14, 2015 by Lovelle Gerth-Myers. Dear Lovelle,For someone so young, you are so wise! Thank you for your words. Thank you so much for your encouraging words Leah! This really blessed me today!